HANCOCK — The road to success started with a coffee break Wednesday morning in the Keweenaw Peninsula. Several dozen area business professionals gathered at the Finnish American Heritage Center as they listened to new business ideas and offered suggestions to ensure a successful start. If you’ve ever had an idea for a business and weren’t quite sure where to go with it, a 1 Million Cups meeting might be the place to start. “Today, I’m talking about Carrot Ranch. It is a literary community online for writers. We work with a specific literary art form. It’s called flash fiction. It’s 99 words. No more. No less,” said Charli Mills, an entrepreneur. Mills is one of two presenters who laid out her business plan and was greeted with suggestions and viewpoints from local business people. She made some contacts that she believes will help her in developing her products. “From, here, I have a couple of people that I’m going to meet up with to talk more about some of the literary outreach that Carrot Ranch does, and to see if we can get more anchored in the community,” said Mills. While Mills’s business promotes writings and publications, Lynn Makela’s new business is providing a shared office space to local business people. 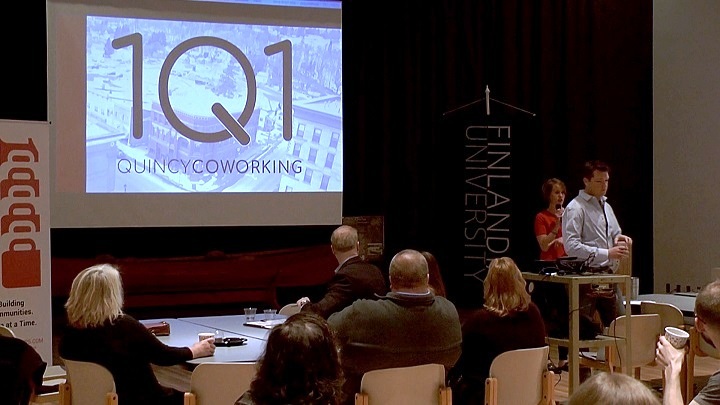 “101 Quincy is a shared working space for people with different ideas. You can be working at the same business but you don’t have to be. You can come in a s a remote worker, as a freelancer, someone that’s just looking for a shared space with access to the basic life needs. WiFi, coffee and a desk,” said Makela, another entrepreneur. After her presentation, Makela received a suggestion that could open her business to a new type of client. “A great suggestion was to figure out a way to outreach to travelers or people that might be visiting the Keweenaw for a shorter amount of time. Maybe a month or three months. Letting them know that they have a space that they can come work to and they don’t have to necessarily sit in a coffee shop with a latte machine in the background,” she said. Her business opens at the end of this month. 1 Million Cups is a free, national program designed to educate, engage, and connect entrepreneurs. Developed by the Kauffman Foundation, 1MC is based on the notion that entrepreneurs discover solutions and network over a million cups of coffee. This is a team effort led by the MTEC SmartZone, Finlandia, Michigan Tech and others.